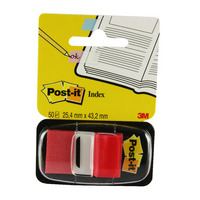 Post-it Red Index Tabs 25mm (Pack of 12x50) 680-1 Pack of 1 3M Post-it flags the repositionable write-on tabs for convenient page marking. Available in six colours ideal for colour coding files and documents. Size 25x75mm (1x1.75ins) Each dispenser contains 50 flags. 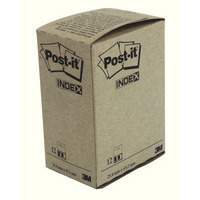 Post-it Blue Index Tabs 25mm (Pack of 12x50) 680-2 Pack of 1 3M Post-it flags the repositionable write-on tabs for convenient page marking. Available in six colours ideal for colour coding files and documents. Size 25x75mm (1x1.75ins) Each dispenser contains 50 flags. 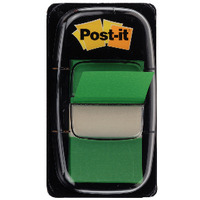 Post-it Green Index Tabs 25mm (Pack of 12 x 50) 680-3 Pack of 1 3M Post-it flags the repositionable write-on tabs for convenient page marking. Available in six colours ideal for colour coding files and documents. Size 25x75mm (1x1.75ins) Each dispenser contains 50 flags. 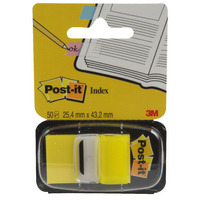 Post-it Yellow Index Tabs 25mm (Pack of 12x50) 680-5 Pack of 1 3M Post-it flags the repositionable write-on tabs for convenient page marking. Available in six colours ideal for colour coding files and documents. Size 25x75mm (1x1.75ins) Each dispenser contains 50 flags. 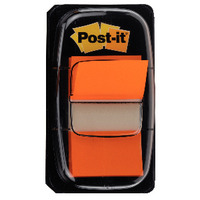 Post-it Orange Index Tabs 25mm (Pack of 12x50) 680-4 Pack of 1 3M Post-it flags the repositionable write-on tabs for convenient page marking. Available in six colours ideal for colour coding files and documents. Size 25x75mm (1x1.75ins) Each dispenser contains 50 flags.